Before midnight of the 11th of October, Typhoon Santi brought its wrath down upon Central Luzon, particularly Pampanga, where I and my family are currently based. It was one of the worst typhoon I have experienced, the wind was howling and was so strong. As the storm rages on, I got a knock on my door, a friend of mine informing me that my mom’s canteen had been toppled down by the storm and an uncle of mine pinned down inside the canteen by a huge Acacia tree. It was a nightmare on my part. It was the longest 4 hours of my life as we try to save my uncle and what has been left of the canteen. After a few days, the 7.2 Earthquake struck Cebu and Bohol. That was the 15th, 4 days passed Typhoon Santi. Another blow, another heartache for my fellow countrymen, I did nothing, to help or support my countrymen. Thinking, I and my family too; have just went through horror a couple of days back. Then Super Typhoon Haiyan (YOLANDA) came. In the aftermath of the storm, at the first sight of the devastation and the damage that Haiyan left on its wake…I cried, seeing my fellow countrymen in ground zero, imagining what hell they went through and the predicament they are in right now. I felt so ashamed of myself, of doing anything, thinking of myself and my family and what we’ve been through. The realization that we were more fortunate than them, that they have lost more than we did. It was an eye opener, a wake-up call. I am a Web Administrator/project Manager, who works from home. In a matter of hours and days, my life was back to normal, but them… who knows how long it would take before they can bring their lives back in order after all this chaos. This is the main reason why I was compelled to start this campaign. To be able to raise funds and be able to extend the help and give back to my fellow countrymen. Truly, I, we are more fortunate than them. And I know if we were the ones who are in their predicament, someone amongst them would be doing the same that I am doing right now… and I am not going to waste the opportunity to help that I am given…hence I came up with One Heart – One Aid, a fundraising campaign for the Philippine Haiyan survivors, my fellow countrymen. This Fund Raising Campaign “One Heart – One Aid: Helping the Philippine Typhoon Haiyan Survivors which I have initiated is in cooperation with Booster.Com which was created by CustomLink. 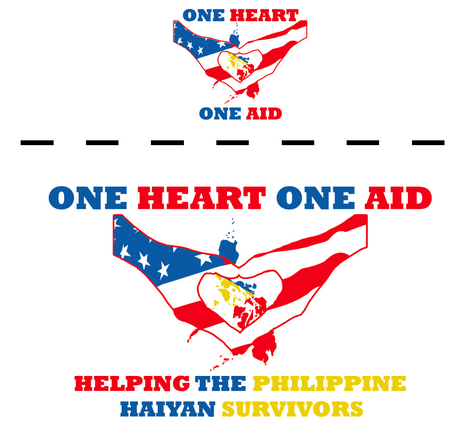 Through this fund raising campaign; friends and families in the United States will have the chance to extend their help by buying the One Heart – One Aid T-shirt. My goal is to reach and raise as much as $3000 of which I will personally oversee that all proceeds will be spent for sacks of rice, bottled water and canned goods, that we will re-pack and deliver and turn-over to The Philippine Red Cross for them to manage the equal distribution of the relief for the Typhoon Haiyan survivors in Borongan, which is my father’s hometown which was also hit hard by the typhoon. At 20 shirts, we will raise about $4.57 per shirt, which is $91 total. At 50 shirts, we will raise about $10.35 per shirt, which is $518 total. At 100 shirts, we will raise about $12.99 per shirt, which is $1,299 total. 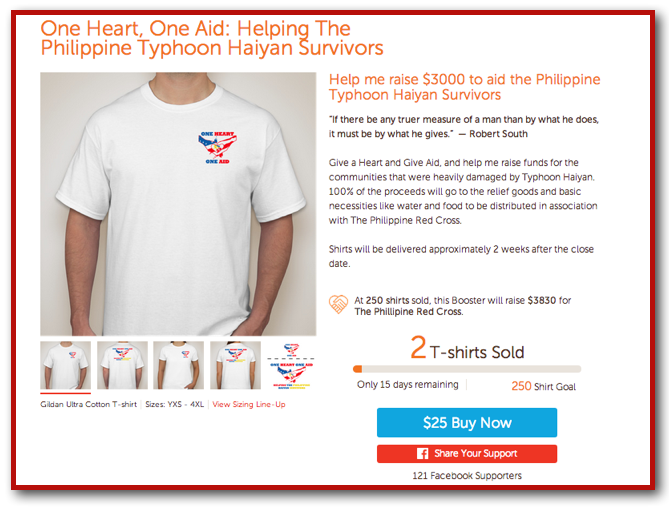 So, Please help me reach my goal to raise funds for my fellow countrymen who were devastated by Super Typhoon Haiyan (Yolanda), share this link to your friends and family who lives in the United States and ask them to buy the One Heart – One Aid T-Shirt which I personally designed as a way to give back to my fellow countrymen. Thank you so much Mr. Michael Sellers for picking up my story and featuring it and my campaign. We and my fellow Filipinos can’t thank you enough for everything you have done for us! Mabuhay Ka, Mr. Sellers and Mabuhay and Bawat Pilipino!